It takes active participation to move forward after combat-related injuries. 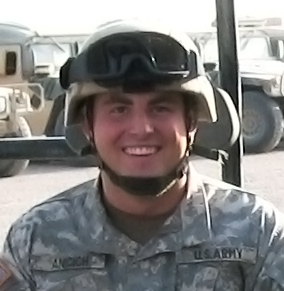 Army veteran Adam Anicich should know — and here he shares his experiences. Adam talks with Army veteran William Marquez, Viriginia Employment Commission, about how to get the job qualifications needed to transfer from a military to a civilian career. Adam's injury happened seven years ago, but he still finds he gets frustrated by some of his lingering symptoms. He suggests turning that frustration into a call to action to stay focused on your recovery. Like other veterans with TBI, Adam finds talking on a cellphone stressful and uncomfortable. He prefers talking face-to-face with people — that way he can hear better and also see the person's body language. A friend of Adam's told him about the Pomodoro Technique — a time management method that breaks up periods of work into 25-minute intervals. In a nutshell, frequent breaks can improve focus and mental agility. "Thanks for all the wonderful feedback and support. It's great to know we're helping some folks out there. Now it's your turn. Send in the questions, ideas, or topics you'd like me to address to info@brainline.org." Adam knows that sometimes for veterans life after combat feels like its being lived on autopilot — with little joy. Adam shares some ideas and strategies to turn that situation around. Pain can negatively color one's life, especially when that person has a brain injury where energy is at a premium as it is. Adam shares his advice. Just like a squad, flight, or platoon, a family needs to come together after a brain injury as a support unit. Adam talks about how the change in family roles can be hard, but patience and communication will help the family work together as a whole.